Following a series of rumors and speculations, the title for the next Assassin’s Creed has just been officially unveiled in a teaser, showcasing a Spartan kicking another off a cliff with the game’s official logo (featuring the new Insignia) appearing afterwards and confirming the game’s full official reveal at E3. The teaser, while only 6 seconds long, bares a several hints about the next game’s setting and potential story and era of history. In this article, every officially confirmed or previously hinted detail will be explored along with theories regarding what is likely to be featured in the highly anticipated next installment. The official teaser of the next Assassin’s Creed confirms the title as “Assassin’s Creed Odyssey”. The Odyssey is one of two major ancient Greek epic poems, is one of two major ancient Greek epic poems attributed to Homer. It is, in part, a sequel to the Iliad, the other work ascribed to Homer. Scholars believe the Odyssey was composed near the end of the 8th century BC, somewhere in Ionia, the Greek coastal region of Anatolia. The war originated from a quarrel between the goddesses Hera, Athena (Juno and Minerva, respectively, in Roman mythology), and Aphrodite, after Eris, the goddess of strife and discord, gave them a golden apple, sometimes known as the Apple of Discord, marked “for the fairest”. Zeus sent the goddesses to Paris, who judged that Aphrodite, as the “fairest”, should receive the apple. In exchange, Aphrodite made Helen, the most beautiful of all women and wife of Menelaus, fall in love with Paris, who took her to Troy. Agamemnon, king of Mycenae and the brother of Helen’s husband Menelaus, led an expedition of Achaean troops to Troy and besieged the city for ten years because of Paris’ insult. After the deaths of many heroes, including the Achaeans Achilles and Ajax, and the Trojans Hector and Paris, the city fell to the ruse of the Trojan Horse. The Achaeans slaughtered the Trojans (except for some of the women and children whom they kept or sold as slaves) and desecrated the temples, thus earning the gods’ wrath. Few of the Achaeans returned safely to their homes and many founded colonies in distant shores. The Romans later traced their origin to Aeneas, Aphrodite’s son and one of the Trojans, who was said to have led the surviving Trojans to modern-day Italy. The Assassin Insignia (which is also the official game logo) features a different design from the one conceived in Assassin’s Creed Origins. The idea for the Insignia of The Hidden Ones (known as the Assassin’s Creed centuries later), according to Origins was conceptualized from Bayek’s eagle skull pendant, and it features the Eye of Horus in the middle. In Odyssey however, the Insignia is shaped in a strikingly similar way to a triangle or the Greek letter “lambda” (Uppercase: Λ, and lowercase: λ) with a Spartan skull in the middle. Lambda was used by the Spartan army as a symbol of Lacedaemon. Given its military pre-eminence, Sparta was recognized as the overall leader of the combined Greek forces during the Greco-Persian Wars. Between 431 and 404 BC, Sparta was the principal enemy of Athens during the Peloponnesian War, from which it emerged victorious, though at a great cost of lives lost. Sparta’s defeat by Thebes in the Battle of Leuctra in 371 BC ended Sparta’s prominent role in Greece. However, it maintained its political independence until the Roman conquest of Greece in 146 BC. Historians have traditionally divided the war into three phases. In the first phase, the Archidamian War, Sparta launched repeated invasions of Attica, while Athens took advantage of its naval supremacy to raid the coast of the Peloponnese and attempt to suppress signs of unrest in its empire. This period of the war was concluded in 421 BC, with the signing of the Peace of Nicias. That treaty, however, was soon undermined by renewed fighting in the Peloponnese. In 415 BC, Athens dispatched a massive expeditionary force to attack Syracuse in Sicily; the attack failed disastrously, with the destruction of the entire force, in 413 BC. This ushered in the final phase of the war, generally referred to either as the Decelean War, or the Ionian War. In this phase, Sparta, now receiving support from Persia, supported rebellions in Athens’ subject states in the Aegean Sea and Ionia, undermining Athens’ empire, and, eventually, depriving the city of naval supremacy. The destruction of Athens’ fleet at Aegospotami effectively ended the war, and Athens surrendered in the following year. Corinth and Thebes demanded that Athens should be destroyed and all its citizens should be enslaved, but Sparta refused. 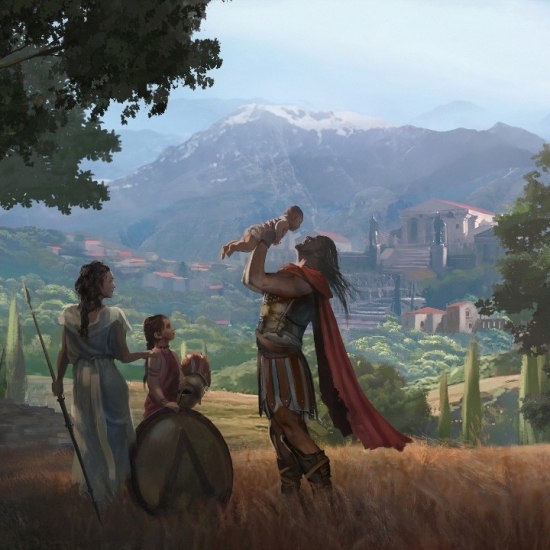 In order to determine the period of the history of Greece in which Assassin’s Creed Odyssey is set, we examine the dates of the most significant moments in its history, which are related to the speculated (and the officially confirmed) elements. Since the Assassin Insignia used as the official logo for the game is different from the one conceived by Bayek in Origins, it is quite likely that the game is set far in the past, before the events of Origins, as every other Assassin’s Creed game featured a variation of the same Insignia conceived by Bayek, and used by the Assassins within the game by the members of the creed. Here’s a summary of all the events mentioned in detail above, that take place before the events of Assassin’s Creed Origins, related to Greek history and Sparta. The Trojan War, which is the major event explored in the Odyssey took place from 1260 to 1180 BCE according to the modern dating system, (Traditional dating: 1194 – 1184 BCE). The Odyssey itself was written near the end of the 8th century BCE. The city-state of Sparta (known in antiquity as Lacedaemon) rose to become a dominant military land-power around 650 BCE, and between 431 and 404 BCE, Sparta was the principal enemy of Athens during the Peloponnesian war. Sparta was later defeated in the Battle of Leuctra in 371 BCE, but it maintained its political independence until the Romance conquest of Greece in 146 BCE. 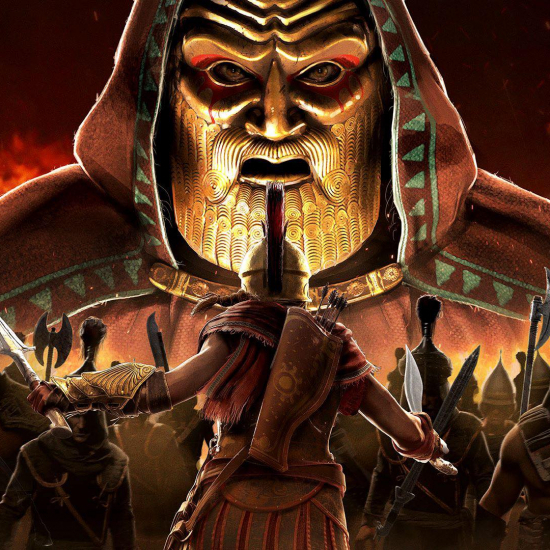 Now according to an official survey sent by Ubisoft to select members of the Assassin’s Creed community, asking them about their preferred future setting for Assassin’s Creed, the Peloponnesian Wars was the first among others, and the only one related to ancient Greece, which is the confirmed setting for the next game. 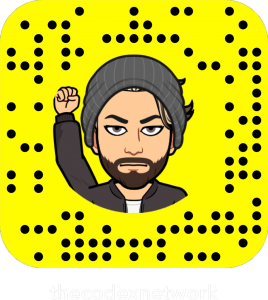 The setting marks a pivotal point in the history of Sparta, a great war that changed it forever, and it marked the last days of its most prosperous state, before its eventually decline, a period similar to what 49 BCE was to Assassin’s Creed Origins. Therefore, Assassin’s Creed Odyssey will likely be set against the backdrop of the Peloponnesian Wars (431 – 404 BCE). The Trojan War originated from a quarrel between the goddesses Hera, Athena (Juno and Minerva, respectively, in Roman mythology). 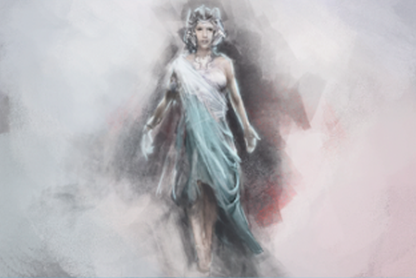 As we know, Juno and Minerva are prominent figures in the Assassin’s Creed mythology. They’re both members of the First Civilization, an advanced humanoid race that predated humanity, evolving on earth millennia ago, and they created mankind as a docile work force and used their own technology, the Pieces of Eden, such as The Apple of Eden which numerous Assassins and Templars came across and fought over their possession for millennia after the demise of the First Civilization. In addition to Hera and Athena (Juno and Minverva, respectively, in Roman Mythology), Poseidon; one of the Twelve Olympians in ancient Greek religion and myth. He was god of the Sea and other waters; of earthquakes; and of horses. In Homer’s Iliad, Poseidon supports the Greeks against the Trojans during the Trojan War. In the Odyssey, during the sea-voyage from Troy back home to Ithaca, the Greek hero Odysseus provokes Poseidon’s fury by blinding his son the Cyclops Polyphemus, resulting in Poseidon punishing him with storms, the complete loss of his ship and companions, and a ten-year delay. According to Greek mythology, the quarrel between the ‘goddesses’ Hera, Athena and Aphrodite occurred because the other goddess, Eris (likely another member of the First Civilization, in the Assassin’s Creed lore), the goddess of strife and discord, gave them a golden apple, sometimes known as the Apple of Discord. The Apple of Eden is a golden orb/ball that is capable of controlling those subjected to its beam, either by affecting their motor functions or the creation of illusions that influence those enthralled by it to act according to the projected vision. Therefore, the Apple of Eden (last seen in Assassin’s Creed Origins, known as The Orb or The Golden Orb by Bayek and those who came across it), in addition to making several appearances in the franchise (including the movie, novels and comics) since the first game, is likely to make an appearance in Assassin’s Creed Odyssey in one shape or form. In addition to the Apple of Eden, Poseidon’s iconic weapon The Trident is another Piece of Eden that is known within the Assassin’s Creed lore from the Last Descendants novels. The Trident was created by the Isu (the First Civilization). Millennia later, it was owned by Alexander the Great, who used it in conjunction with a Staff of Eden to construct his mighty empire. Alexander used the Trident on the battlefield which insured that his army is always undefeated. When divided, the Prongs of Eden function as daggers, each with a special ability of its own; one causes intense sensation of fear, the other induces a sense of admiration while the third influences blind faith. The fact that Poseidon and his trident are also part of Homer’s Iliad (a prequel to the Odyssey), as well as being in touch with Odysseus, makes it likely for Poseidon and/or his Triden to somehow be referenced in Assassin’s Creed Odyssey. If the Trident can be found by the historical Assassin or perhaps a Templar who manages to gain access to its location in Ancient Greece (since it’s already been found and in possession of Sebastian Monroe in present day), then perhaps whoever finds it might eventually lead to Alexander the Great taking possession of it. 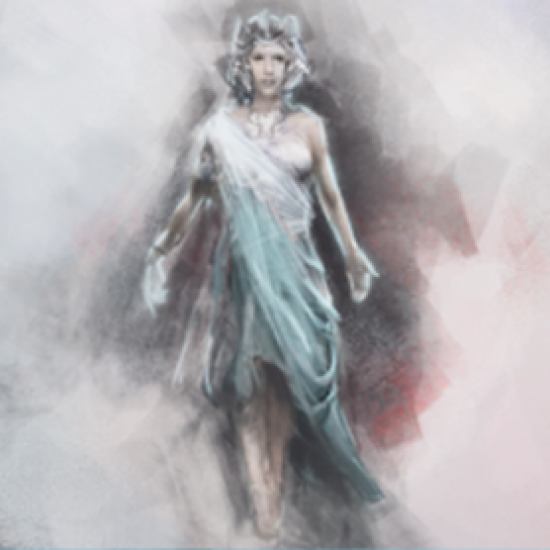 The Assassin’s Creed lore, however, tells us that The Golden Fleece is in fact, a First Civilization technology, also known as the Shroud of Eden. Like other Isu technology, there’s more than one Shroud in existence. Jason, a legendary figure in Greek mythology and the leader of the Argonauts, a group of heroes, came across the Golden Fleece (Shroud of Eden #1), and was able to come to contact with the Isu member, Consus (also known as the Erudite God) through the Shroud of Eden. Consus was known to be a great scientist prior Toba Catastrophe. Around 1923 Isu Era, the War of Unification took place and Consus helped his master Hephaestus to create devastating weapons, including the Swords of Eden. After the death of Hephaestus, Consus created the Shrouds of Eden as means to heal the fallen soldiers of the war, as the shroud was capable of impressive healing capabilities on a cellular level. Later, Consus became aware of his impending natural death, the one biological frailty that the Shrouds could not heal, Consus transferred his consciousness into a prototype Shroud in order to live on in a digital existence. The process was successful, however, he found himself unable to communicate and therefore being forgotten for centures. The Shroud of Eden was referenced numerous times throughout the franchise, but only became a major focal point in Assassin’s Creed: Syndicate. Due to the presence of the Golden Fleece in Greek mythology, it is possible that the Shroud of Eden could somehow play a role and be referenced in Assassin’s Creed Odyssey. The Assassin’s Creed and the Templar Order have existed for millennia (both emerged circa. 75,000 BCE) in different forms and under different names. 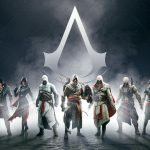 All Assassin’s Creed-related projects identified them as Assassins and Templars, due to the fact that all the previous games, comics, books and novels took place during or after the time the real-life Order of the Knights Templar and Al-Hashashin (the Assassins) emerged. However, due to the fact that Assassin’s Creed Origins takes place before either of those orders existed in real-life, the Assassins were known as The Hidden Ones, and the Templars were referenced as The Order of the Ancients. Bayek established The Hidden Ones as a creed using the iconic insignia that we’ve always known, inspired by the print that his eagle skull creates when placed on the sand in a certain angle. However, Bayek’s hidden blade was retrieved from the tomb of a previous Assassin, therefore Bayek established The Hidden Ones, but he’s certainly not the first Assassin, as the ideology predates him by millennia and he merely established his own creed based on similar moral code and objectives. Therefore, Assassin’s Creed Odyssey will likely feature another form of the Assassin’s Creed, probably known by a different name. 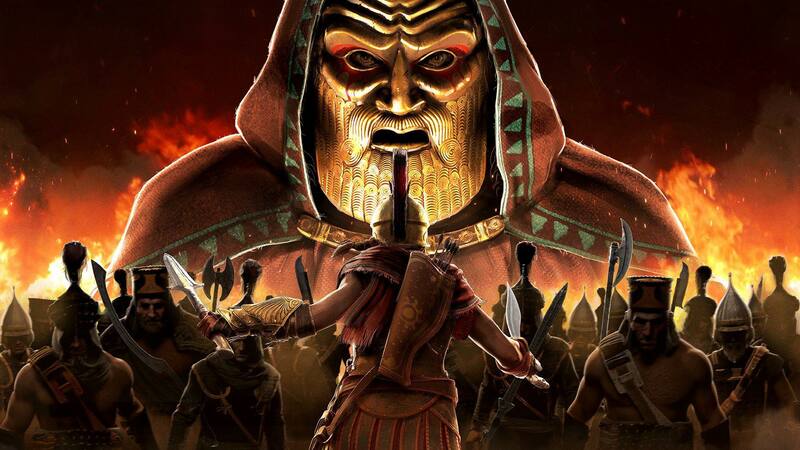 In addition, The Order of the Ancients, which was already an established and an all-knowing all-powerful order in Assassin’s Creed Origins, and the game did not explore any of its roots and how it came to possess such great power and influence, which makes it likely for Odyssey to put the magnifying glass on that aspect, and likely involving them in the conflict. Plato (428/427 or 424/423 – 348/347 BC) is a philosopher in classical greece and the founder of the Academy in Athens the first institution of higher learning in the western world. He is widely considered to be the most pivotal figure in the development of philosophy, especially in Western tradition. Unlike most of his philosophical contemporaries, Plato’s entire work is though to have survived intact for the 2400 years. A fictional island mentioned within an allegory on the hubris of nations in Plato’s works Timaeus and Critias, where it represents the antagonist naval power that besieges “Ancient Athens”, the pseudo-historic embodiment of Plato’s ideal state in The Republic. In the story, Athens repels the Atlantean attack unlike any other nation of the known world, supposedly giving testament to the superiority of Plato’s concept of a state. The story concludes with Atlantis falling out of favor with the deities and submerging into the Atlantic Ocean. Plato’s vague indications of the time of the events—more than 9,000 years before his time—and the alleged location of Atlantis—”beyond the Pillars of Hercules”—has led to much pseudoscientific speculation. Plato is known to have freely borrowed some of his allegories and metaphors from older traditions. This led a number of scholars to investigate possible inspiration of Atlantis from Egyptian records of the Minoan Eruption of Thera, the Sea Peoples invasion, or the Trojan War. “The Minoan eruption of Thera, also referred to as the Thera eruption, Santorini eruption, or Late Bronze Age eruption, was a major catastrophic volcanic eruption with a Volcanic Explosivity Index (VEI) of 6 or 7 and a dense-rock equivalent (DRE) of 60 km3 (14 cu mi), Dated to the mid-second millennium BCE, the eruption was one of the largest volcanic events on Earth in recorded history. The eruption devastated the island of Thera (known today as Santorini), including the Minoan settlement at Akrotiri and communities and agricultural areas on nearby islands and the coast of Crete with a related earthquake and tsunami. On the other hand, other historians have rejected this chain of tradition as implausible and insist that Plato created an entirely fictional nation as his example, drawing loose inspiration from contemporary events such as the failed Athenian invasion of Sicily in 415–413 BC or the destruction of Helike in 373 BC. According to Greek mythology, Atlantis is Poseidon’s domain, which leads to the speculation that if Assassin’s Creed Odyssey is to feature high-tech First Civilization sites (as Origins and most Assassin’s Creed games did, often appearing as hidden vaults enclosed within mountains or glaciers, buried beneath the sands or built underground with more modern structures such as pyramids, tombs, cathedrals and other monuments were deliberately built on top of them to hide their secrets and allow only select few to find secret passages to reach their main gates, which too often require a Piece of Eden, a passcode or an individual with high concentration of Isu DNA to gain access to them), the idea of Atlantis being an advanced First Civilization vault or complex submerged beneath the water (whether by natural disaster or even voluntarily as means to conceal its existence and what is contained within it be it a Piece of Eden such as the Apple of Eden, the Trident or even First Civilization members put under cryogenic sleep to escape the Toba Catastrophe) may not be very far from being real. Spyridon Marinatos, the discoverer of the Akrotiri archaeological site, suggested that the Minoan eruption is reflected in Plato’s story of Atlantis. UPDATE (6/21/18): After the world premier of Assassin’s Creed Odyssey, the majority of the officially released information and assets confirm the majority of the theories of this article, including the time period in which the game is set, the conflict and the mythological ties as well as the presence of the First Civilization, a a very intriguing concept art was shared on the official Assassin’s Creed website, showcasing what appears to be a First Civilization site [TOP LEFT IMAGE]. The image used is a darkened version, upon toning [TOP RIGHT IMAGE], it becomes clearer that the Isu site is vast and technologically advanced. It also strikingly resembles a previously released concept art by Hugo Puzzuoli for Assassin’s Creed: Syndicate [TOP CENTER IMAGE] of a First Civilization area that never made it into the game. 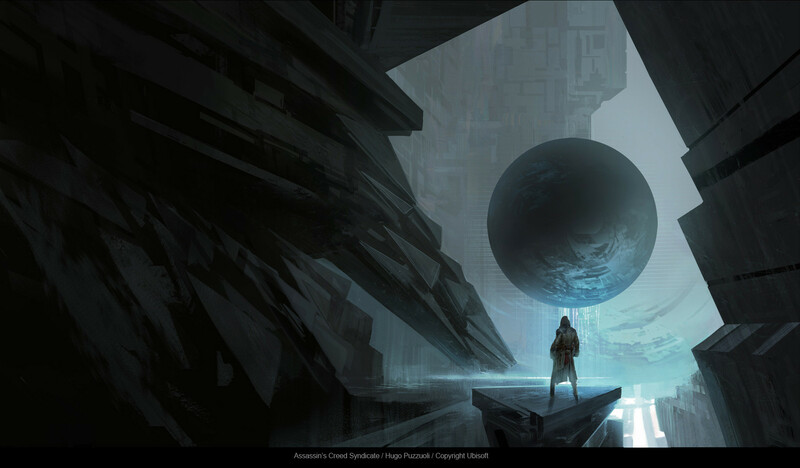 It appears that since Odyssey is being developed by the Ubisoft Quebec and the Assassin’s Creed: Syndicate team, the previous concept art was repurposed to be an actual site in Odyssey. 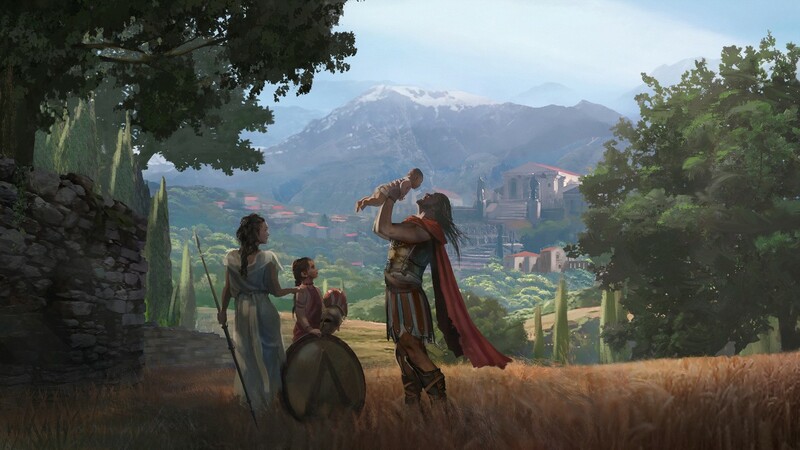 Now, upon further examination of the artwork, we see a technologically advanced entrance and a greek-inspired area or an Island in the distance, which further reinforces the theory that Atlantis could be featured in Assassin’s Creed Odyssey as technologically advanced a First Civilization area. In Greek history, the Antikythera mechanism is an ancient Greek analogue computer and orrery used to predict astronomical positions and eclipses for calendar and astrological purposes decades in advance. It could also track the four-year cycle of athletic games which was similar to an Olympiad, the cycle of the ancient Olympic Games. The artifact was discovered among a wreckage retrieved from a wreck off the coast of the Greek island Antikythera. The instrument is believed to have been designed and constructed by Greek scientists and has been variously dated to about 87 BC, or between 150 and 100 BC, or to 205 BC, or to within a generation before the shipwreck, which has been dated to approximately 70-60 BC. According to the Assassin’s Creed lore, the Antikythera mechanism is a portion of a prognostication device created by the Isu (the First Civilization), used to prophesize probably future events based on current circumstances. The probably-based process is referred to as the Calculations, by the Isu. The prognostication device was notably utilized by Minerva, during the First Civilization’s attempts to stop the solar flare from hitting the Earth circa 75,000 BCE. The fact that the Antikythera mechanism is present both in the history of Greece and was discovered in the 20th century, as well as being part of the Assassin’s Creed lore, the possibility of utilizing or at least learning something about it or the full prognostication device that the mechanism is part of, is high. Assassin’s Creed Odyssey is set to be fully explored at E3 2018. Stay tuned for more information.